Monte has now traveled to the Rainbow Bridge to be with those that have gone before him. 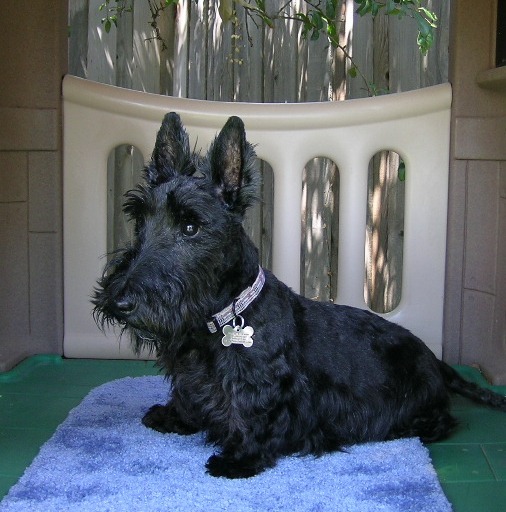 Monte was surrendered to Scottie Kingdom Rescue, when his owner's vet suggested Monte be euthanized, due to old age and blood in his urine. Monte had not even visited the vet, yet this permanent step was being suggested because of the costs involved with testing Monte for his various ailments. Thankfully, Monte's family contacted us for a solution. We picked up Monte and rushed him to our vet, where multiple tests and x-rays were performed. Monte had a horrific amount of blood in his urine, and it was confirmed he had a "raging" urinary tract infection that had not been treated, which was causing him a great amount of discomfort. The x-rays did not show any bladder stones. We then proceeded with a course of antibiotics. Monte was also diagnosed with Coccidia, an intestinal parasite, that was causing severe diarrhea and bloody stools, as well as an ear infection. Within 72 hours of beginning the antibiotics, Monte's urine returned to normal, and with proper medication, the symptoms of Coccidia were also beginning to subside. Monte showed us how much better he was feeling, by standing up on his hind legs, and begging for treats! Can you imagine how excited we were to see this Scottie boy feeling so much better!!! After Monte's symptoms subsided for 10 -14 days, he returned to our vet for further tests and an ultra-sound of his bladder. The vet was searching for signs of bladder stones or bladder cancer. Unfortunately, a large mass was seen in his bladder and has been confirmed as Transitional Cell Carcinoma (Cancer). We are devastated with this news, as Monte is such a sweet Scot. Rarely does he complain, instead, only wanting a large dose of love and attention, some playtime with his Nylabone chew toy, tennis balls, and some serious belly rubbing! We have now started Monte on Piroxicam, which has been know to either slow the growth of bladder tumors, or in some cases, shrink it. We chose this course of action with Monte because of his senior age (Monte is 12 years of age), instead of chemo-therapy and/or radiation, which can have some side effects because of the size and location of the tumor. If consultations with our veterinary specialists somehow change our feelings on Monte's treatment, we will post that information immediately. We plan to keep Monte comfortable, and pain free, and follow his illness through. He deserves to live his last days in dignity. If you are able to help us with Monte's Care, please donate what you can to help him, and all of our other Rescue Dogs. We are not able to save the lives we do, without your help. Thank you!